This unique park is located in the northwest corner of Twin Brooks at 119 St and Twin Brooks Way (MAP). The Park abuts lower Blackmud Creek on the north and Whitemud Creek on the west. The main park area was constructed in 2004 and is recognizable by its many hills covered in prairie grasses and designed to represent glacial features called drumlins. The northwest portion of the Park is called The Pointe and retains natural features representative of pre-urban development. The District Park was conceived as an informal and passive use natural area with limited infrastructure. Its design facilitates a back-to-nature experience while providing paths to explore the many hills, trees, bushes, and flowers, as well as easy access to the top-of-the bank trail system bordering the Twin Brooks community along the Blackmud and Whitemud Creek ravines. Access to the Pointe provides an opportunity for a deeper nature experience, reflection, and enjoyment of Whitemud Creek from 4 observation benches. It encourages families to be creative in their enjoyment of the park. Biking, kites, sleds, dog walking, tag, hide and seek, jogging, cross-country skiing and various forms of nature appreciation are appropriate activities. Informal nature walks are held during the spring and fall seasons and occasionally at other times. 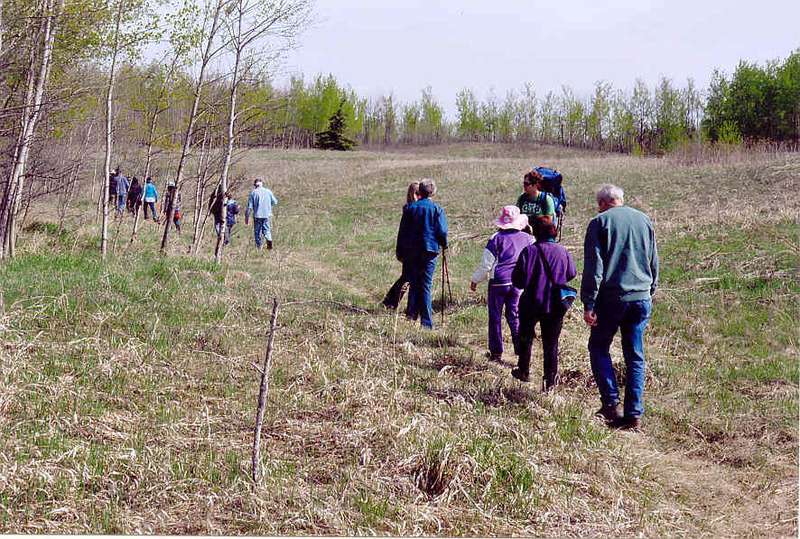 These guided walks are held within the District Park, along the top-of-the-bank trail network, and within the adjacent Whitemud & Blackmud Creek ravines. The Park serves as a meeting location and starting point for many of our walks, as well as other nature-oriented programs and events run by the Twin Brooks Community League and others. Preparations: It is important to come well prepared for the weather and for walking on informal paths and uneven surfaces, particularly when we are going in to the ravine environment. Sturdy walking shoes/boots, walking sticks,hats, sunscreen, insect repellant, and water are all helpful items, depending on the weather and expected terrain. Also, you may wish to bring along binoculars and camera to get better looks at wild animals and plants and to take home some memories. There are no currently scheduled nature walks or other special nature events. You are invited you to join this new Friends group as a volunteer steward for a very unique District Park serving the needs of residents in southwest Edmonton. Our vision is: “a Park that supports informal recreation and education activities that are in harmony with a scenic and diverse natural environment.” We work in cooperation with the City of Edmonton Parks department and the Twin Brooks Community League. Stewardship activities include: garbage clean-up; monitoring for vandalism and maintenance needs; organizing nature walks; facilitating installation of modest infrastructure (e.g. park benches, picnic tables); coordinating naturalization plantings; and involving youth in projects and activities where possible. 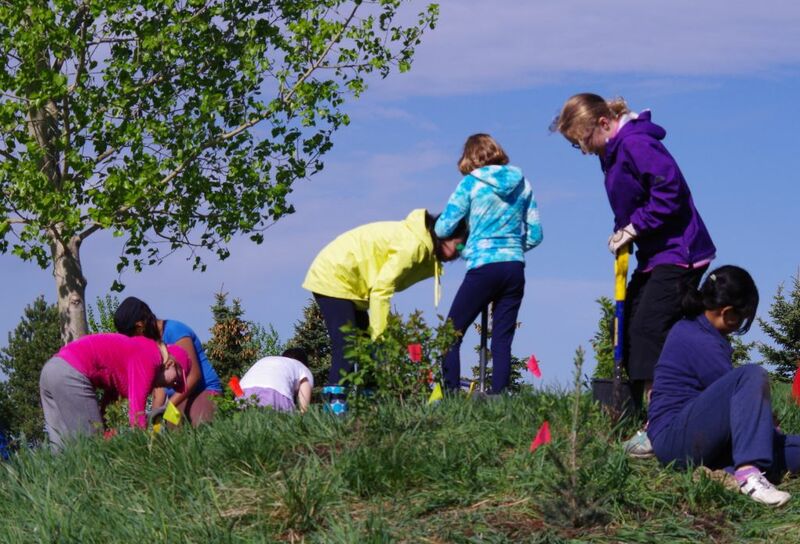 Close to 150 students participate annually, with each student planting at least one native tree or shrub in designated planting areas on unmowed, grassy knolls in the northeast corner of the Park. These naturalization plantings are designed to create additional diversity of natural habitats that attract wildlife characteristic of the adjacent ravine environment. This project provides excellent learning opportunities about the importance of maintaining and re-establishing natural areas within our City. The students are encouraged to visit and monitor the success of their plantings and to enjoy this beautiful parkland environment with their family and friends. 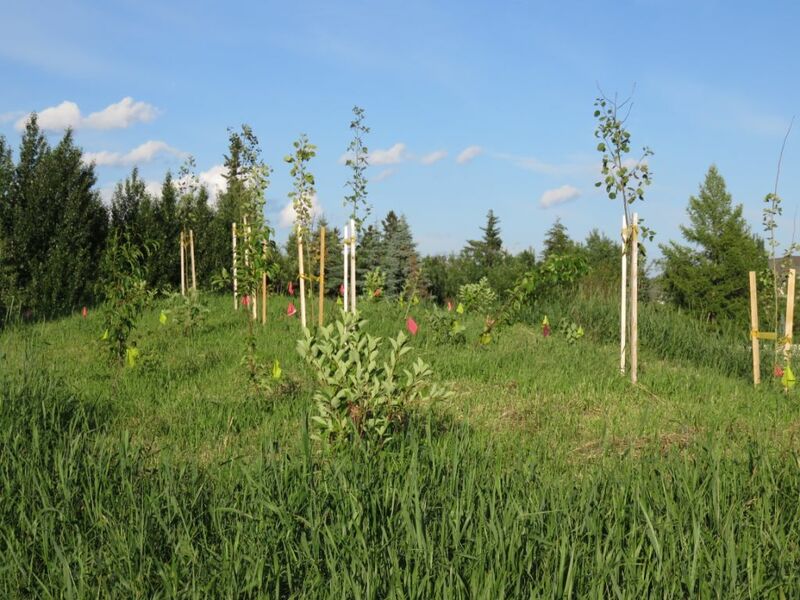 Their efforts help to ensure that this unique Park supports a high diversity of plants and animals, contributing to visitor enjoyment and acting as an important buffer between residential areas and the natural environments of the adjacent Whitemud and Blackmud Creek ravines. Planning is underway for naturalization of the open grassy boulevards adjacent to 119th Street between 9B Ave. and Twin Brooks Way, just to the south of the Twin Brooks District & Nature Park. The primary objectives for this project are : a) improved aesthetics for walkers, joggers and bikers along the multi-use pathway on the east side of 119th St., b) enhanced vegetation diversity to improve biodiversity connections and small bird movements between the District Park, the nearby ravine environments and Twin Brooks residential areas, and c) slowing of traffic on 119th St. by creating a narrower visual profile for the collector roadway right-of-way. This project proposes to remove mowing from central portions of the grassy boulevards adjacent to 119th St. and the planting of native and non-native trees and shrubs within these unmowed strips. 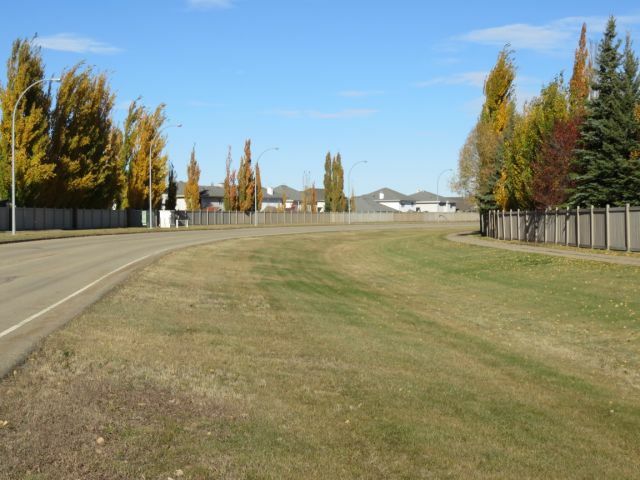 Grass mowing would still occur along a 2m-wide strip adjacent to the multi-use sidewalk and a 5m-wide strip adjacent to the shoulder of the roadway. This project is an initiative of Friends of the Twin Brooks District & Nature Park, in cooperation with the Twin Brooks Community League, George P. Nicholson Elementary School and the City of Edmonton’s Community Services department. An Open House is being held at the George P. Nicholson School library (1120 113 Street NW) on Tuesday, March 17 from 7:00 - 9:00 p.m to provide further information on this initiative and to seek comments and assistance from area residents. Information on the City of Edmonton's Naturalization Program is available at www.edmonton.ca/naturalization. If you would like more information about the 119th St. proposal, including opportunities to help out, please contact nature@twinbrooks.ca. Residents of Twin Brooks and surrounding areas who enjoy walking in Twin Brooks District and Nature Park may be familiar with the four memorial benches located at the Pointe. They provide a wonderful opportunity to sit and enjoy the beauty of nature in the midst of the City. The City of Edmonton has pre-approved three or four additional sites for aggregate style benches to be located in the main Park area. The cost of the bench, cement pad and memorial plaque is $3500 and is to be paid by the individual or group making the application for the placement of a bench. Tax deductible receipts will be issued by the City. Placing a memorial bench is an unique opportunity to honour a loved one or mark a special occasion. They make our Park a more enjoyable place in which to spend time. 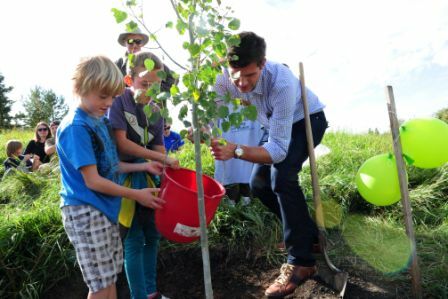 Proceeds from the Benchmark Program go toward the preservation and development of green spaces within the City of Edmonton. If you would like more information about this program, please contact the Twin Brooks Community League at nature@twinbrooks.ca. An application form can be found at http://www.edmonton.ca/for_residents/programs/benchmark-program.aspx. Hidden Brook Park at 111 Street is part of the Partners in Parks program through the City of Edmonton. There are no funds allocated by the city for this park; it is completely community funded. If no one were to take care of this park, the city would cover all the beds with mulch, and not bother with any of the planters or any upkeep other than trimming the trees when required. So many people in Twin Brooks benefit from this beautiful park as they use the walking trails that pass by it. It was made possible by donations raised at events such as the annual Twin Brooks Community BBQ, and by the many hours of volunteer work.